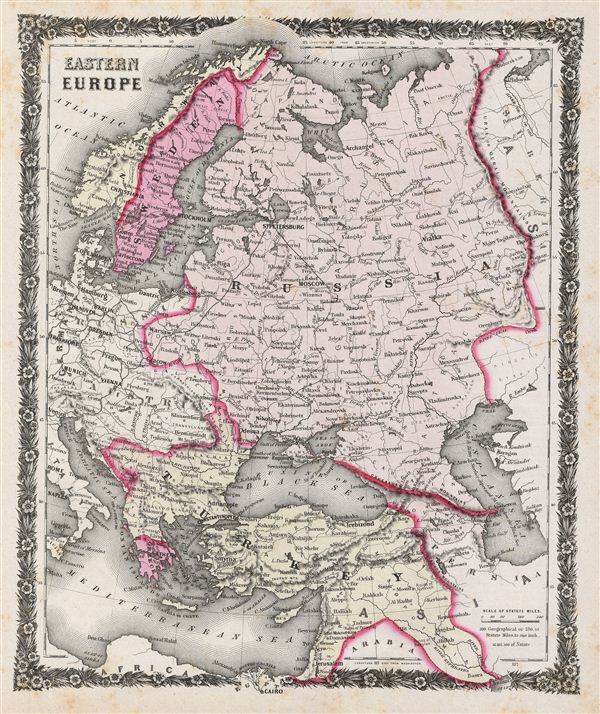 A rare example of Colton's 1858 map of eastern europe. Centered over Russia, the map covers Norway, Sweden, Turkey and Greece, and parts of Germany, Prussia, Italy and Austria. This beautiful hand colored map is a copper plate engraving, featuring a delicate floral style border only used by Colton in this particular atlas. It offers fine detail throughout with elevation rendered by hachure. Divided and color coded according to country, shows major towns and cities, railroads as well as geological features such as lakes and rivers. Russia at this time was under the suzerainty of Tzar Alexander the II. Alexander is best known for his liberal reforms including the emancipation Reform of 1861, considered to be the most important event in 19th century Russian history, which liberated Russia's countless serfs. Although this particular map is not dated, it is issued as part of the1859 edition of Colton's Illustrated Cabinet Atlas and Descriptive Geography. Very good. Blank on verso. Stains on margins.